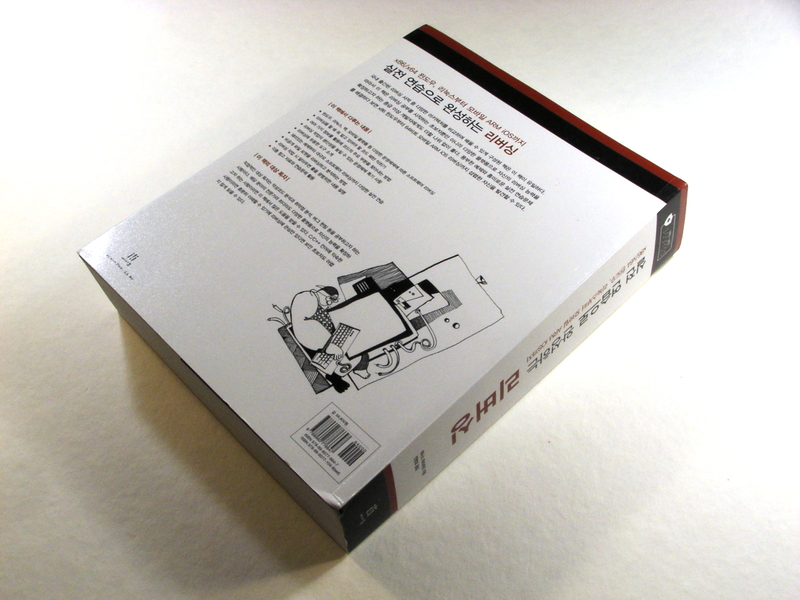 The book is also known as RE4B and "Understanding Assembly Language". Written by Dennis Yurichev (yurichev.com). NEWS: The first volume of RE4B in Chinese published in 2017 is available for download here. Sorry, there are no more A5/ebook versions. It's too hard for me to maintain several versions. And there were also "lite" shortened versions, which were also dropped. There is also partial translation to Chinese: as a single HTML file; epub file. ...excellent and free (Pete Finnigan, Oracle RDBMS security guru.). Amsterdam University of Applied Sciences (link: "Recommended reading"). Edith Cowan University (link; archived). Budapest University of Technology and Economics (link; archived). University of Oulu (link; archived). Coburg University of Applied Sciences (Hochschule Coburg) (link, archived). West Virginia University at Parkersburg (link, archived). University of Porto (link, archived). Cork Institute of Technology (link, archived). Indian Institute of Technology Indore. If you know about others, please drop me a note: dennis(a)yurichev.com. Those who supported me during the time when I wrote significant part of the book: https://github.com/DennisYurichev/RE-for-beginners/blob/master/donors.tex. Thanks a lot to every donor! ... hacker news, reddit, habrahabr.ru, Russian-speaking RE forum. The book at Goodreads website. English; Russian; Spanish; Brazilian Portuguese; Italian; French; Hebrew; Deutsch; Polish; Indonesian; Chinese; Japanese. All exercises are moved to standalone website: challenges.re. Feel free to send me corrections, or, it's even possible to submit patches on book's source code (LaTeX) on GitHub! Any suggestions, what also should be added to my book? My current plans for this book: Objective-C, Visual Basic, anti-debugging tricks, Windows NT kernel debugger, .NET, Oracle RDBMS. In April 2017, translation to Chinese has been finished by Chinese PTPress publisher. They are also the Chinese translation copyright holder. 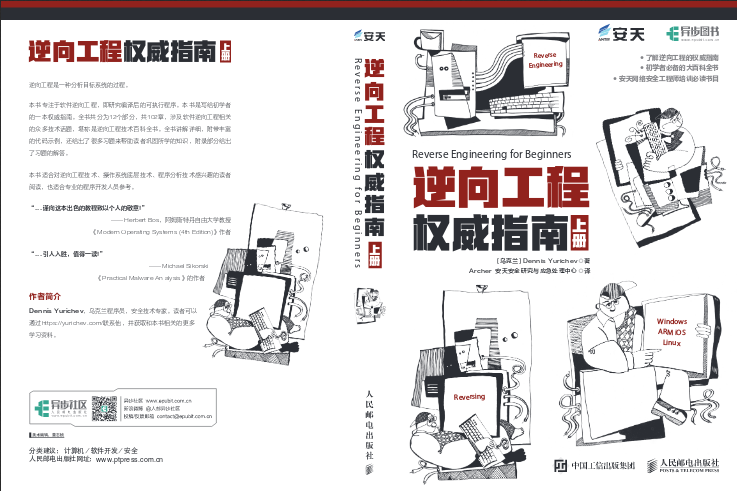 It's available for order here: http://www.epubit.com.cn/book/details/4174 or https://www.amazon.cn/dp/B06XZ9JKH3. Some kind of review and history behind the translation: http://www.cptoday.cn/news/detail/3155. Principal translator is Archer, to whom I owe so much. He was extremely meticulous (in good sense) and reported most of known mistakes and bugs, which is very important to literature like this book. I'll recommend his services to any other author! Guys from Antiy Labs has also helped with translation. Here is preface written by them. 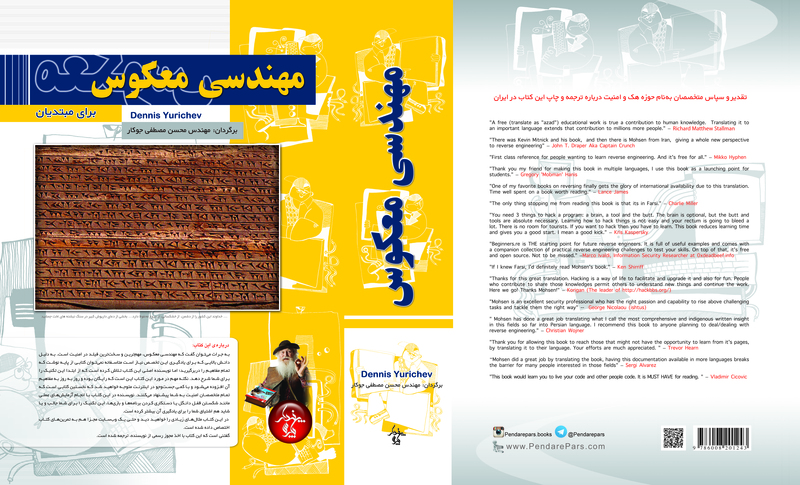 In 2016 the book has been translated by Mohsen Mostafa Jokar (who is also known to Iranian community by his translation of Radare manual). It is available on the publisher’s website (Pendare Pars). 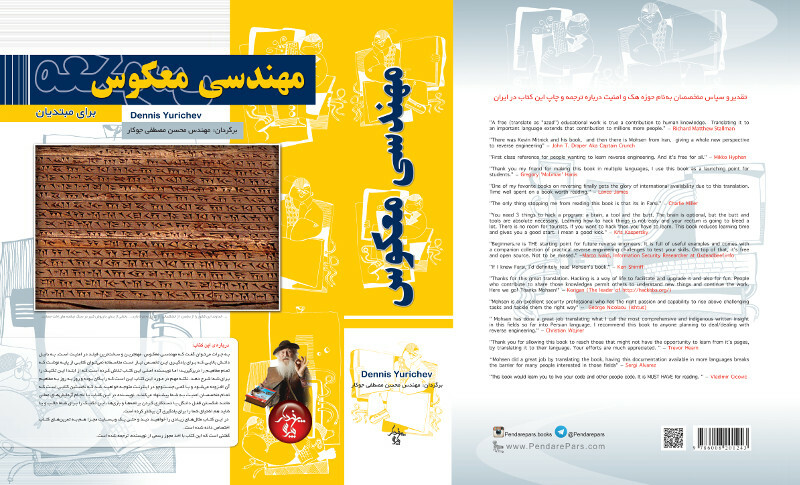 Registration of the book in National Library of Iran: http://opac.nlai.ir/opac-prod/bibliographic/4473995. In January 2015, Acorn publishing company (www.acornpub.co.kr) in South Korea did huge amount of work in translating and publishing my book (state which is it in August 2014) in Korean language. Now it's available at their website. Translator is Byungho Min (@tais9). Cover pictures was done by my artist friend Andy Nechaevsky: facebook/andydinka. They are also the Korean translation copyright holder. 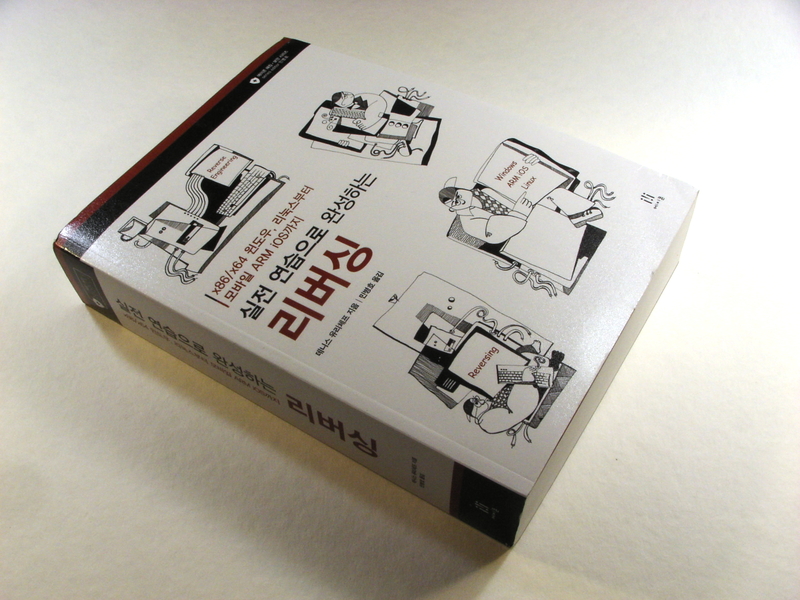 So if you want to have a "real" book on your shelf in Korean language and/or want to support my work, now you may buy it.